The history of rhinoplasty (Greek: ῥίς, rhis, nose + πλάσσειν plassein, to shape), began in antiquity. Surgical rhinoplasty began in ancient Egypt and ancient India. In India, it was developed by the ayurvedic physician Sushruta (c. 800 BC). Non-surgical rhinoplasty was a later development, with the history of non-surgical rhinoplasty occurring mainly in the 21st century. The Roman encyclopaedist Aulus Cornelius Celsus. During the Roman Empire (27 BC – AD 476) the encyclopaedist Aulus Cornelius Celsus (c. 25 BC – AD 50) published the 8-tome De Medicina (On Medicine, c. AD 14), which described plastic surgery techniques and procedures for the correction and the reconstruction of the lips, the ears, the nose, et cetera, and for the amputation of diseased and damaged parts of the human body. At the Byzantine Roman court of the Emperor Julian the Apostate (AD 331–363), the royal physician Oribasius (c. AD 320–400) published the 70-volume Synagogue Medicae (Medical Compilations, AD 4th century), which described facial-defect reconstructions that featured loose sutures that permitted a surgical wound to heal without distorting the facial flesh; how to clean the bone exposed in a wound; debridement, how to remove damaged tissue to forestall infection and so accelerate healing of the wound; and how to use autologous skin flaps to repair damaged cheeks, eyebrows, lips, and nose, to restore the patient’s normal visage. The Ottoman rhinoplast physician Şerafeddin Sabuncuoğlu (1385–1468). Nonetheless, during the centuries of the European Middle Ages (AD 5th – 15th centuries) that followed the Imperial Roman collapse (AD 476), the 5th-century BC Asian plastic surgery knowledge of the Sushruta samhita went unknown to the West until the 10th century AD, with the publication, in Old English, of the Anglo-Saxon physician’s manual Bald's Leechbook (c. AD 920) describing the plastic repair of a cleft lip; as a medical compendium, the Leechbook is notable for categorizing ailments and treatments as internal medicine and as external medicine, for providing herbal medical remedies, and for providing supernatural incantations (prayers), when required. In the 11th century, at Damascus, the Arab physician Ibn Abi Usaibia (1203–1270) translated the Sushruta samhita from Sanskrit to Arabic. In due course, Sushruta’s medical compendium travelled from Arabia to Persia to Egypt, and, by the 15th century, Western European medicine had encountered it as the medical atlas Cerrahiyet-ul Haniye (Imperial Surgery, 15th century), by Şerafeddin Sabuncuoğlu (1385–1468); among its surgical techniques featured a breast reduction procedure. 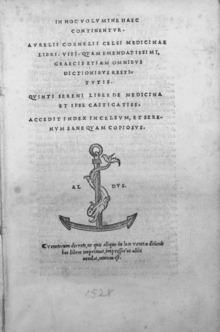 In Italy, Gasparo Tagliacozzi (1546–1599), professor of surgery and anatomy at the University of Bologna, published Curtorum Chirurgia Per Insitionem (The Surgery of Defects by Implantations, 1597), a technico–procedural manual for the surgical repair and reconstruction of facial wounds in soldiers. The illustrations featured a re-attachment rhinoplasty using a biceps muscle pedicle flap; the graft attached at 3-weeks post-procedure; which, at 2-weeks post-attachment, the surgeon then shaped into a nose. Artificial nose, made of plated metal, 17th-18th century Europe. This would have been worn as an alternative to rhinoplasty. In 1815, Dr. Karl Ferdinand von Gräfe wrote the book about rebuilding the human nose. In Germany, rhinoplastic technique was refined by surgeons such as the Berlin University professor of surgery Karl Ferdinand von Gräfe (1787–1840), who published Rhinoplastik (Rebuilding the Nose, 1818) wherein he described fifty-five (55) historical plastic surgery procedures (Indian rhinoplasty, Italian rhinoplasty, etc. ), and his technically innovative free-graft nasal reconstruction (with a tissue-flap harvested from the patient’s arm), and surgical approaches to eyelid, cleft lip, and cleft palate corrections. Dr. von Gräfe’s protégé, the medical and surgical polymath Johann Friedrich Dieffenbach (1794–1847), who was among the first surgeons to anaesthetize the patient before performing the nose surgery, published Die Operative Chirurgie (Operative Surgery, 1845), which became a foundational medical and plastic surgical text. (see strabismus, torticollis) Moreover, the Prussian Jacques Joseph (1865–1934) published Nasenplastik und sonstige Gesichtsplastik (Rhinoplasty and other Facial Plastic Surgeries, 1928), which described refined surgical techniques for performing nose-reduction rhinoplasty via internal incisions. In the United States, in 1887, the otolaryngologist John Orlando Roe (1848–1915) performed the first, modern endonasal rhinoplasty (closed rhinoplasty), about which he reported in the article The Deformity Termed “Pug Nose” and its Correction, by a Simple Operation (1887), and about his management of saddle nose deformities. In the early 20th century, Freer, in 1902, and Killian, in 1904, respectively pioneered the submucous resection (SMR) septoplasty procedure for correcting a deviated septum; they raised mucoperichondrial tissue flaps, and resected the cartilaginous and bony septum (including the vomer bone and the perpendicular plate of the ethmoid bone), maintaining septal support with a 1.0-cm margin at the dorsum and a 1.0-cm margin at the caudad, for which innovations the technique became the foundational, standard septoplastic procedure. In 1921, A. Rethi introduced the open rhinoplasty approach featuring an incision to the columella to facilitate modifying the tip of the nose. In 1929, Peer and Metzenbaum performed the first manipulation of the caudal septum, where it originates and projects from the forehead. In 1947, Maurice H. Cottle (1898–1981) endonasally resolved a septal deviation with a minimalist hemitransfixion incision, which conserved the septum; thus, he advocated for the practical primacy of the closed rhinoplasty approach. In 1957, A. Sercer advocated the “decortication of the nose” (Dekortication des Nase) technique which featured a columellar-incision open rhinoplasty that allowed greater access to the nasal cavity and to the nasal septum. Nonetheless, in the mid–20th century, despite such refinement of the open rhinoplasty approach, endonasal rhinoplasty was the usual approach to nose surgery — until the 1970s, when Padovan presented his technical refinements, advocating the open rhinoplasty approach; he was seconded by Wilfred S. Goodman in the later 1970s, and by Jack P. Gunter in the 1990s. Goodman impelled technical and procedural progress with the article External Approach to Rhinoplasty (1973), which reported his technical refinements and popularized the open rhinoplasty approach. In 1982, Jack Anderson reported his refinements of nose surgery technique in the article Open Rhinoplasty: An Assessment (1982). During the 1970s, the principal application of open rhinoplasty was to the first-time rhinoplasty patient (i.e. a primary rhinoplasty), not as a revision surgery (i.e. a secondary rhinoplasty) to correct a failed nose surgery. In 1987, in the article External Approach for Secondary Rhinoplasty (1987), Jack P. Gunter reported the technical effectiveness of the open rhinoplasty approach for performing a secondary rhinoplasty; his improved techniques advanced the management of a failed nose surgery. Hence does contemporary rhinoplastic praxis derive from the primeval (c. 600 BC) Indian rhinoplasty (nasal reconstruction via an autologous forehead-skin flap) and its technical variants: Carpue’s operation, the Italian rhinoplasty (pedicle-flap reconstruction, aka the Tagliocotian rhinoplasty); and the closed-approach endonasal rhinoplasty, featuring exclusively internal incisions that allow the plastic surgeon to palpate (feel) the corrections being effected to the nose. 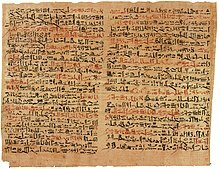 ^ "Academy Papyrus to be Exhibited at the Metropolitan Museum of Art". The New York Academy of Medicine. 2005-07-27. "Archived copy". Archived from the original on 2010-11-27. Retrieved 2008-08-12. CS1 maint: Archived copy as title (link). Retrieved 2008-08-12. ^ Mazzola, Ricardo; Mazzola, Isabella. Gurtner, Geoffrey C.; Neligan, Peter C. (eds.). Plastic Surgery: Principles. Elsevier Health Sciences. pp. 11–2. ISBN 978-1-4557-1052-2. ^ Chernow BA, Vallasi GA, eds. (1993). The Columbia Encyclopedia (5th ed.). Columbia University Press. pp. 488–9. ^ a b Rinzler, CA (2009). The Encyclopedia of Cosmetic and Plastic Surgery. New York NY: Facts on File. p. 151. ^ Rana RE, Arora BS (2002). "History of plastic surgery in India". J Postgrad Med. 48 (1): 76–8. PMID 12082339. ^ "Ye Olde Nose Job: The 16th Century Diagrams that Detail the World's Earliest Plastic Surgery". Daily Mail. London. 2010-12-28. ^ Goldwyn RM (July 1968). "Johann Friedrich Dieffenbach (1794–1847)". Plast. Reconstr. Surg. 42 (1): 19–28. doi:10.1097/00006534-196842010-00004. PMID 4875688. ^ Roe, John O. (1989). "The Deformity Termed 'Pug Nose' and Its Correction by a Simple Operation". Archives of Otolaryngology–Head & Neck Surgery. 115 (2): 156–7. doi:10.1001/archotol.1989.01860260030010. PMID 2643972. ^ Rethi A (1934). "Operation to Shorten an Excessively Long Nose". Revue de Chirurgie Plastique. 2: 85. ^ "New 20th Century Developments with Rhinoplasty". Becker Rhinoplasty Center. Retrieved 21 March 2015. ^ Goodman WS, Charles DA (February 1978). "Technique of external rhinoplasty". J Otolaryngol. 7 (1): 13–7. PMID 342721. ^ Gunter JP (March 1997). "The merits of the open approach in rhinoplasty". Plast. Reconstr. Surg. 99 (3): 863–7. doi:10.1097/00006534-199703000-00040. PMID 9047209. ^ Goodman WS (1973). "External Approach to Rhinoplasty". Canadian Journal of Otolaryngology. 2 (3): 207–10. PMID 4791580. ^ Anderson JR, Johnson CM, Adamson P (1982). "Open Rhinoplasty: An Assessment". Otolaryngology–Head and Neck Surgery. 90 (2): 272–4. PMID 6810277. ^ Gunter JP, Rohrich RJ (August 1987). "External Approach for Secondary Rhinoplasty". Plastic and Reconstructive Surgery. 80 (2): 161–174. doi:10.1097/00006534-198708000-00001. PMID 3602167. This page was last edited on 10 January 2019, at 23:11 (UTC).